her a set of 2D softies for her birthday. 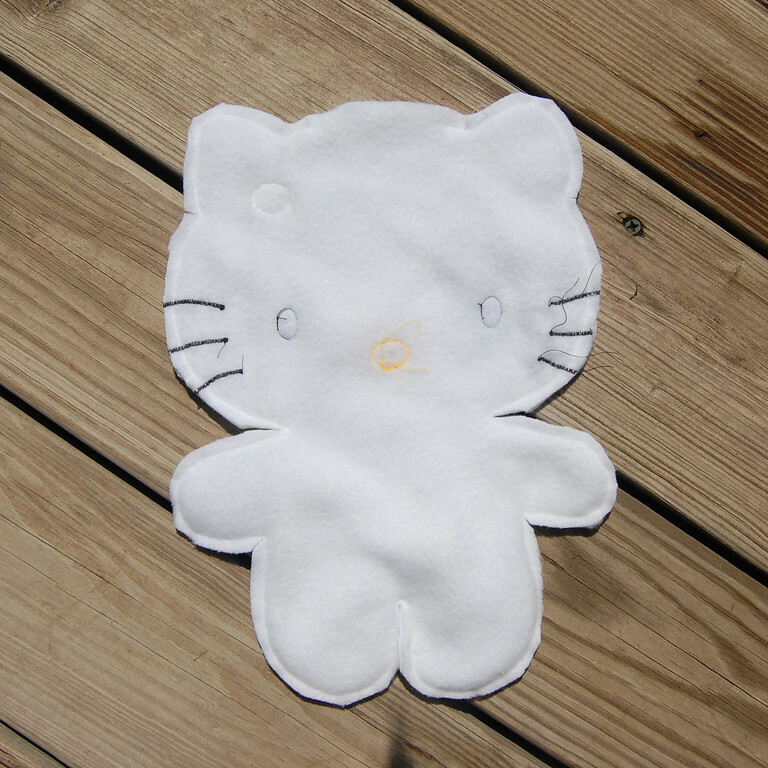 as a 2D toy, and has almost invisible seams. Find a picture of the character - we like books, but the internet is also an option. Raise your right hand and swear on anything you consider sacred that you will not sell commercially what you are about to make. Hope fervently that your workmanship will not make it too easy to keep your vow. 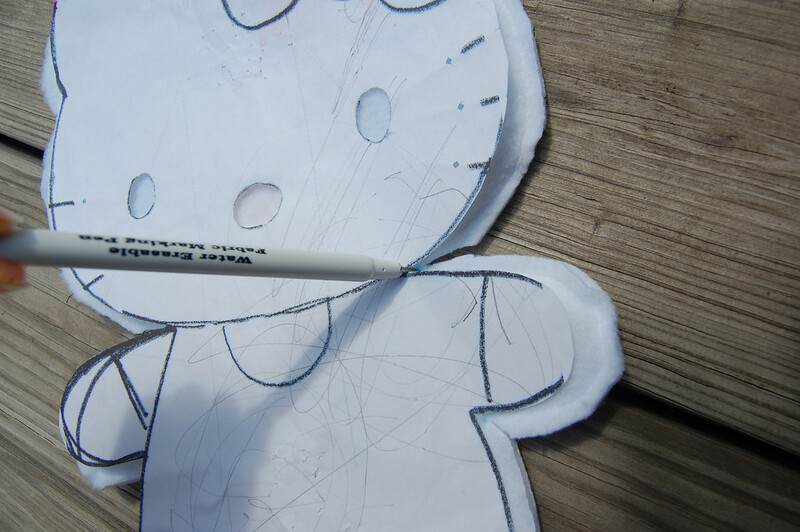 Find tracing paper or parchment paper and trace the outline of the character or just print it out if you don't mind wasting ink. Enlarge the image using your printer/photocopier/scanner-and-photoshop combo to the size you want. Print out the final image on paper and cut it out. Also cut out the relevant facial features - this helps position these accurately later. Fold fabric to double thickness, right sides facing. Trace the image, giving a 1/4" or 1/2" seam allowance or (if lazy like me), pin the pattern to the fabric and just cut around it. Mark on the wrong side of one piece of fabric, the critical points/nodes/corners in the pattern where you would have to stop sewing, lift the presser foot and shift the fabric to change the stitching direction. Then mark on the right side of the fabric piece(s) the position of the facial features through the holes you cut out in Step 5. Sew (pin first if you must) the two pieces together, right sides facing. 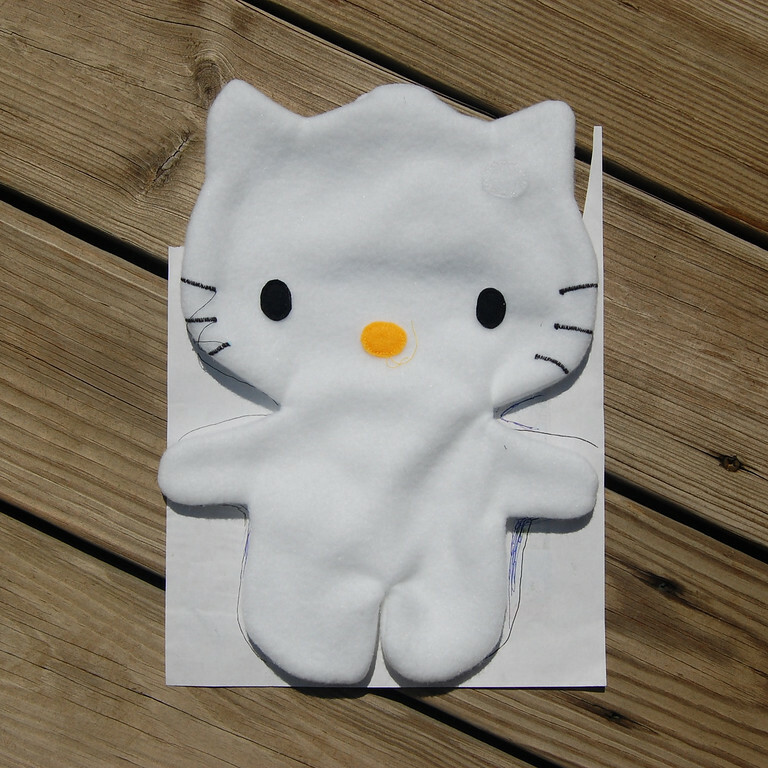 Use whatever seam allowance you gave in Step 6. Remember to sew to all the nodes/corners that you marked in Step 7. These will help keep the corners sharp and preserve the shape/proportions of the softie when it is stuffed. Leave an opening for turning out and stuffing. Choose the straightest possible edge for the position of the opening. 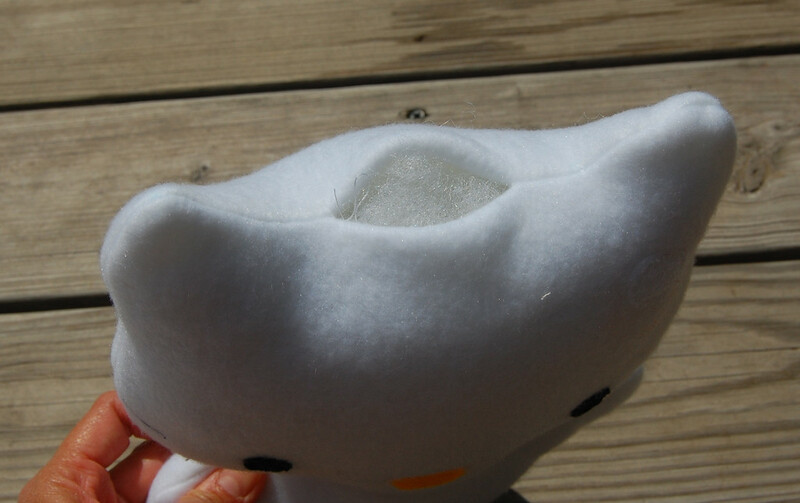 You don't want to, for instance, be hand-stitching the ear or foot shut. If intending to also sew clothes for the softie, lay it flat on paper and trace the outline with about 2-3 mm allowance all around. This will be your pattern for clothes. Since this is a flat/2D softie, the clothes will also be flat/2D. 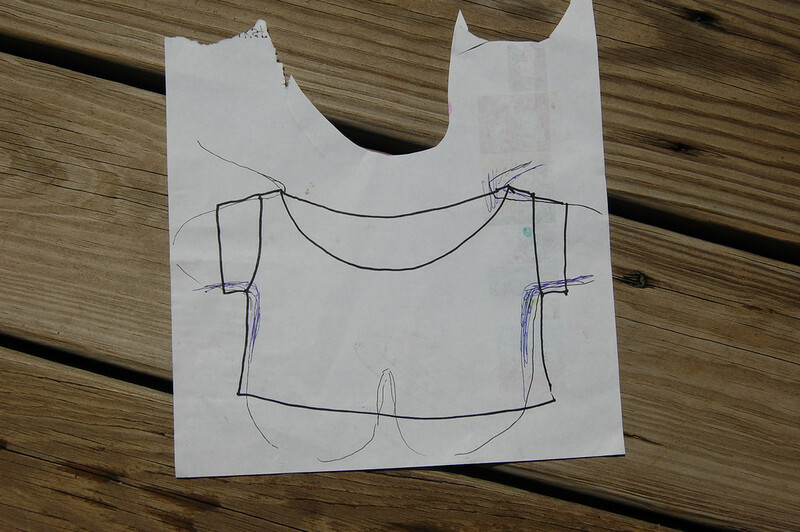 Sketch the shape of the garment around this outline. Stuff and sew up the opening. at home now. Erk. Will start on some clothes next week. awesome! 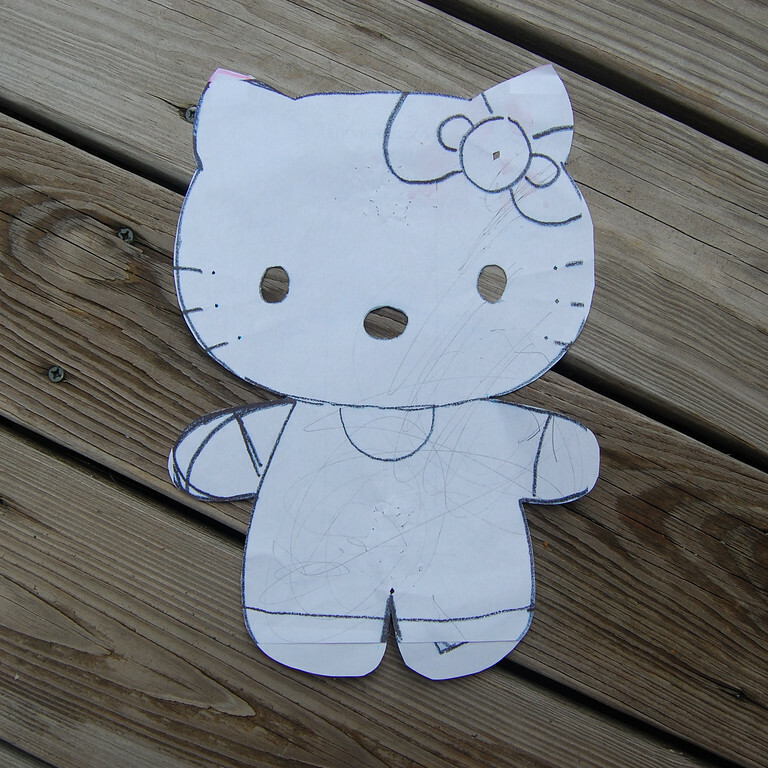 my daughter is also a hello kitty fanatic, i'll probably end up giving in and making her one, too. one question: how are you going to make the bow? still with fleece? and just hand stitch it on? why didn't you sew it on the face and fold it down so you could sew all the edges down? guess that's more than one question! Hi Lisa - will post on the clothes sometime later. The bow and flower are going to be velcro-ed on. So if you look carefully at the "Embellish" photo (can't remember which Step), you might see a little white velcro circle on HK's forehead. I'd normally do a stuffed felt bow but am trying to save time (ha ha - and I made 10 HKs- save time, indeed) so it's just a single layer of red wool-blend felt. The flower I haven't decided yet. Probably a stuffed felt flower. It's the clothes that are giving me nightmares because I want to be lazy and not use bias tape. More later. Just a hint. I have found when making small softies that the easiest way is to fold the fabric in half, trace the pattern and then sew along this line. Once you have finished (and left a gap for turning!) then you cut around the shape leaving your desired sem allowance. So much easier with fiddly turns and little softies. 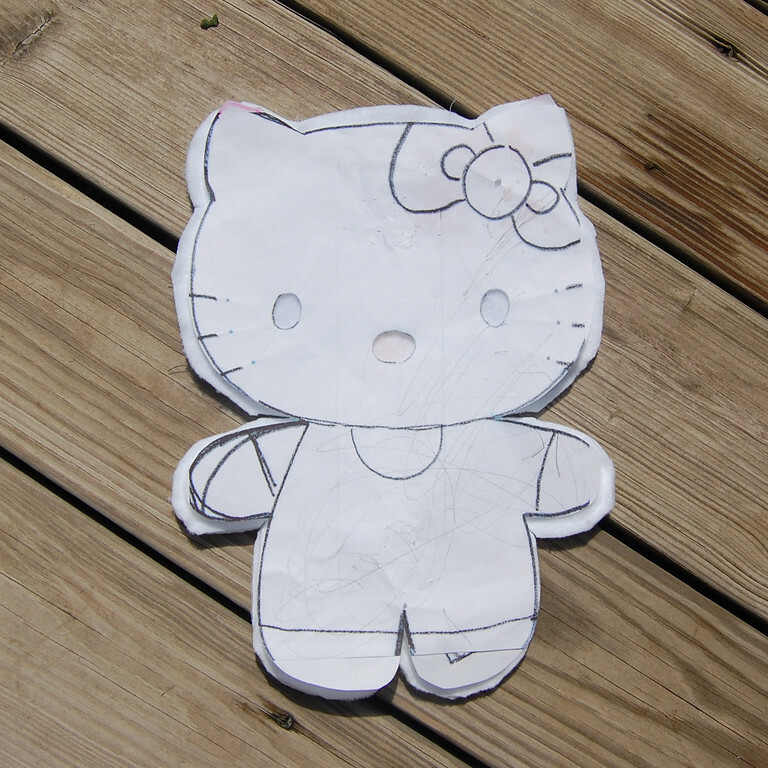 Hi, I just finished my version of the Hello Kitty and my daughter adored it! 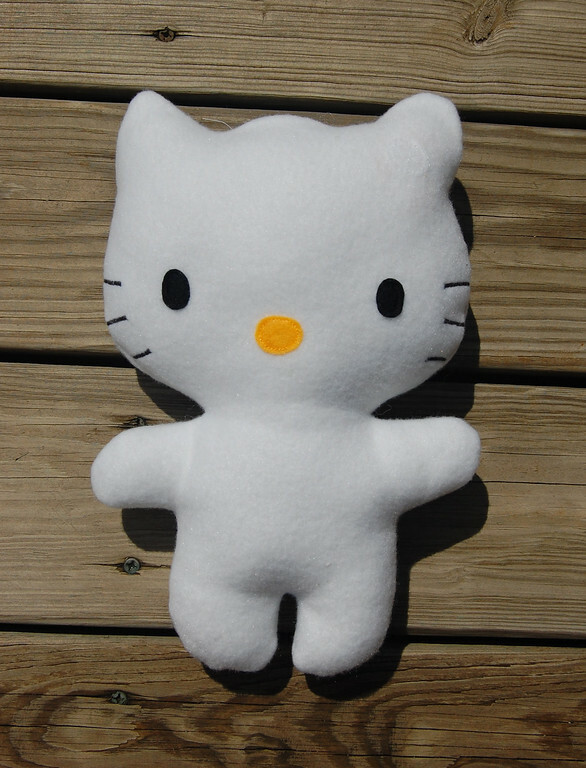 Our HK is naked as well and I cannot find a way to make her clothes... I have made a fabric bow and attached it to her head by hand stitching. Thank you for the inspiration. This is fantastic! And so nice for those of us who worship hard to find or embarrassing characters. =) (leave me and my Spock doll alone!) Thanks tons, I'll be linking. You did it again, she is adorable...naked and all. Did you use white fleece for Humpty Dumpty too? 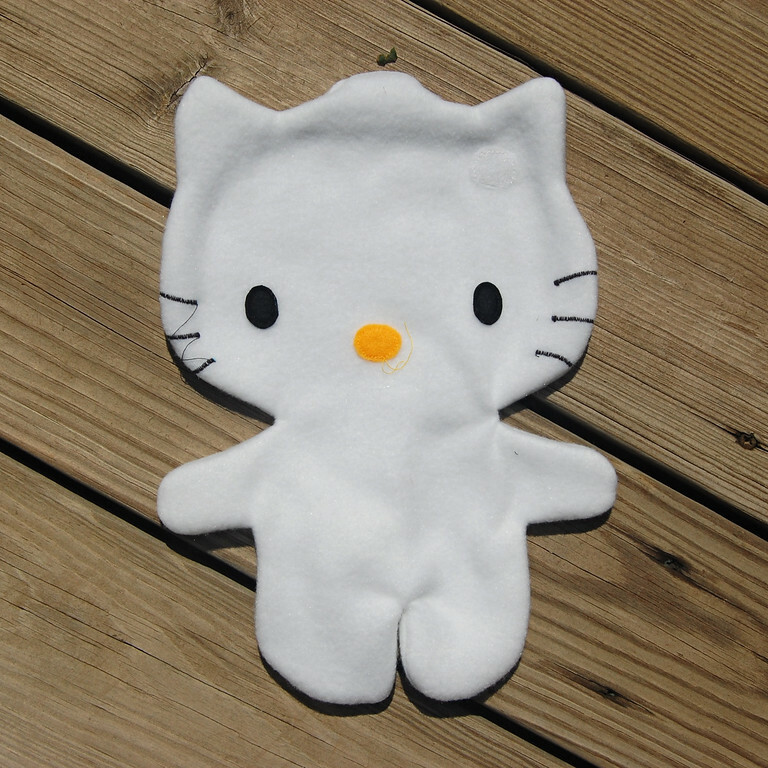 And the bow tie that you made for him, could that be used for Miss Kitty's hair bow as well? Just wondering because I think in my house Humpty Dumpty and Hello Kitty are going to be BFF. 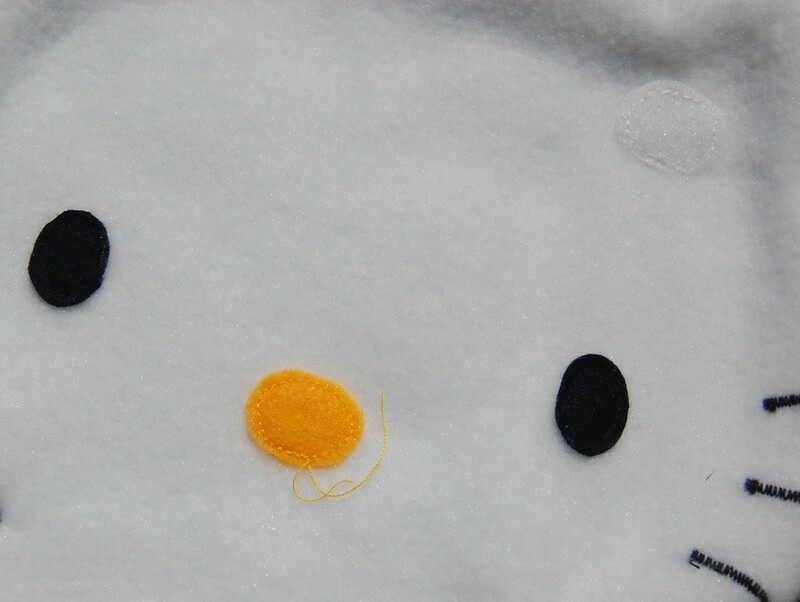 Your Hello Kitty is cute but I am ridiculously in love with your Maisy set. Thanks for sharing the idea. Hey, I just wanted to let you know that I linked to this post on my blog. Hope that's okay! Thank you, thank you, thank you, for this tutorial! My daughter is obsessed with the Guff from "Oh the Thinks You Can Think." Of course, Guff's are not commercially available. I hoped that you would have advice for me on my situation. Thank you! Now I get to make the Guff, and her parents (also featured in the book, and named as the parents by my child). We plan on making a smaller version of them for Operation Christmas Child shoeboxes to be sent all over the world. Thanks for posting the tutorial. I have made a number of these for the children in my extended family, and they are always loved. I made my neice a Hello Kitty dress with the doll wearing a matching dress. So thank you for your tutorial.